No matter how much space you have you can enjoy fresh pizza ingredients, you can plant a pizza garden quite successfully in the ground or in containers. Imagine slice your own fresh tomatoes, basil, green peppers, and more to be used on a pizza you make yourself, there really isn’t a better way to enjoy pizza! It is much easier than you think and makes a great garden project to do with your kids. Summer is nearly here but it is not too late to start a pizza garden. 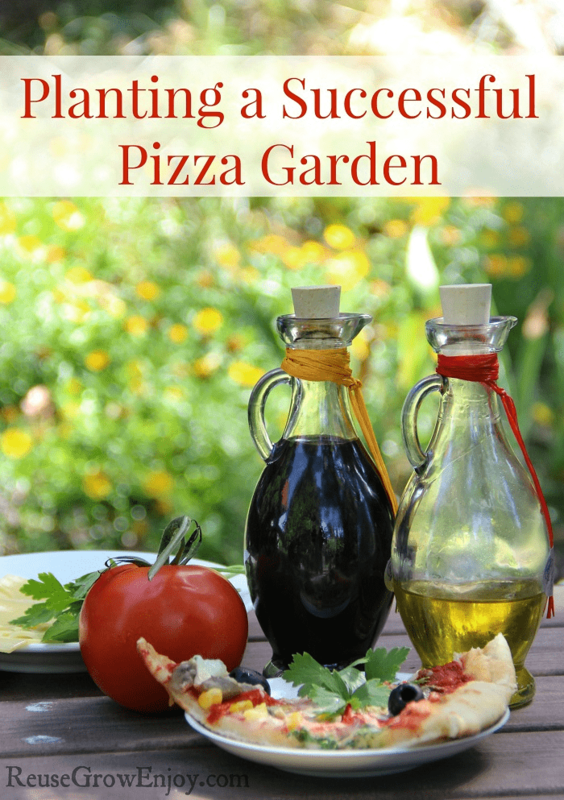 In fact, summer is the perfect time for growing a pizza garden! First, you want to find a nice sunny patch to plant or place your containers in. Most veggies are sun loving plants and you will want a spot that gets full sun most of the day. You can grow your pizza garden in large pots with good drainage, mark out a square on the ground to plant in- 4’x4′ is a nice manageable size, or plant in something circular and mark out wedge shaped pieces(like a pizza) for each plant- a baby pool is perfect for this. Got a place in mind? Good, let’s move on to the next step. Next, you should make sure that your soil is good and rich- mix in some organic topsoil and/or compost to give it a really good base to start from. If you are direct planting into the ground you will probably need to overturn the earth to soften up the soil, then remove weeds, rocks, and roots. A raised garden bed is always a good idea in my opinion as there are so many benefits. You will have fewer weeds to contend with, it looks neat and tidy, they have great drainage, prevent soil from being impacted, and help keep some pests out of the garden. Select the plants you want to grow- San Marzano, Cherry, or Roma Tomatoes are good tomato varieties for your garden. Choose other items that the family enjoys on their pizza- garlic, peppers, herbs, eggplant, onions, etc…You can start your garden from seeds or small plants- if you are new to gardening or just want faster results I recommend picking up plants from your local home and garden store. Choosing plants or seeds from a catalog or garden store is a fun and frugal family activity. You can let everyone choose one yummy ingredient for your pizza garden. Once you have planted your seeds or seedlings you will want to keep it watered well, especially in the early days while they are taking root. If you have planted your pizza garden in containers keep in mind that the soil dries out much quicker than in the ground. Watering often washes away soil nutrients so you will also want to fertilize regularly- at least biweekly according to the package directions of your favorite brand. I personally recommend avoiding pesticides as you will be eating this produce, one of the benefits of growing your own food is being able to limit or cut out altogether harmful pesticides. Instead, opt for a spray bottle filled with water, a teaspoon of dish soap, and a pinch of cayenne pepper- spray leaves and stems not the edible parts. You can also dust the plants with Diatomaceous Earth to help keep bugs away. When it is time for harvest grab a basket and head out with the kids to gather your bounty in a basket, pick carefully, pull a few weeds, rinse away garden pests with your soapy spray, and continue with watering/fertilizing for a healthy garden all summer long. You can add your fresh herbs to the pizza and also cut and dry them out for future use in all your recipes. If you have an abundant crop of tomatoes consider canning them and they will be ready anytime you need fresh sauce- include garlic, onions and herbs from your garden for flavor! The best part is these ingredients can be used for so much more than just pizza, they can be added to soups, calzones, pasta dishes, and a host of other yummy recipes. What ingredient will you plant in your DIY Pizza Garden? If you enjoyed this post, you may also want to check out How To Grow Garlic, Grow Peppers Better or Grow Tomatoes Better With These 6 Tips.